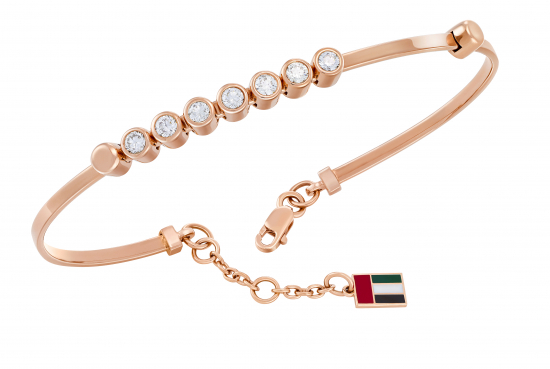 On the occasion of UAE’s 47th National Day, home grown brand Amira Jewels launches, in the spirit of the union, the exclusive, limited edition “Unity” collection celebrating and honoring the glory of the nation. The Unity collection consists of three handcrafted, one-of-a-kind designs, each reflective of a unique characteristic that defines the UAE but all a tribute to the bond that connects the 7 Emirates to stand together as a single, fortified country. The three pieces of jewellery all consist of 7 dazzling diamonds, each one standing for an individual Emirate. The first design in the collection, Wings of Unity, is a charming, butterfly-shaped bracelet signifying the grace with which the UAE soars. Dance of Unity, also a bracelet but distinctive with its 7 moving diamonds signifies the rhythm of the nations progress. The Bloom of Unity, is a stunning diamond pendant that also pays homage to the nation’s glorious heritage with 7 strings of pearls. It was in 1971 that the originally individual Emirates came together to become a federal union, the United Arab Emirates. The UAE flag is a formal expression of the strong heritage of the country that was inspired by a poem on Arab unity written by poet Safiul Deen Al Holi who symbolized characteristics in colours like white for good deeds, green for fertile plains, dark for battles and swords as red. The limited edition Unity collection is be available across all three Amira jewels stores in Dubai Festival City Mall; Marina Mall, Abu Dhabi and Manar Mall, Ras Al Khaimah. AMIRA, part of Joyalukkas Holding Inc. with its stores in Dubai Festival City Mall; Marina Mall, Abu Dhabi and Manar Mall, Ras Al Khaimah. AMIRA caters to all the young women in the Middle East with its trendsetting pieces. The brand flaunts exquisite designs of jewellery with exclusive designs, collections and exceptional service at their stores. AMIRA is also the exclusive partners for ALLOVE diamonds in the whole of Middle East.